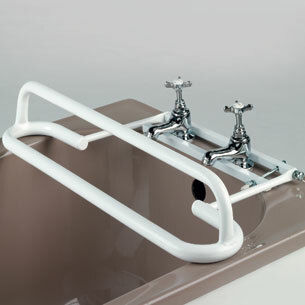 Double Loop Tap Rail, Hinges Up When Not In Use. This double loop tap rail is strong, durable and easy to clean; steel construction coated in plastic for rust resistance. Fits most tap style and hinges up when not in use. My mother is very pleased with it. She still has to have strength in her arms to pull herself up but it is so much better than struggling to get out just using the sides of the bath. Now she can have a bath when she wants rather than waiting for me to be there just in case she gets stuck.